ACP Countries: Sidelined by Europe again? After a Year of the EPA with Europe, what benefits for the Caribbean? Export led growth: who will lead in the Caribbean? September 27, 2012 marked the tenth anniversary of the beginning of negotiations for Economic Partnership Agreements (EPAs) between the European Union (EU) and the 79-member countries of the African, Caribbean and Pacific (ACP) group. But, non-governmental organisations (NGOs) throughout Europe say it is not a time for celebration. According to a joint statement issued by many of the NGOs, “10 years on, EPA negotiations continue to be fraught with concerns that, far from supporting development efforts and promoting regional integration, will do more harm than good”. 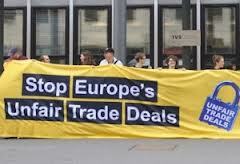 This anniversary has prompted protests in Brussels, the location of the EU headquarters, and in other European capitals, notably London where demonstrations were held outside the ministry of UK Business Secretary Vince Cable, calling on him to keep his promise to make trade work for development and making specific demands regarding EPAs. A letter was delivered to Cable, signed by leaders of 18 powerful UK organisations including the Trade Justice Movement, the Trades Union Congress, the Fairtrade Foundation, the National Union of Teachers; and the War On Want. Apart from being the 10th anniversary of the beginning of the negotiations on the EPAs, the significance of the protests in Europe by European-based organisations on behalf of the ACP countries, is that the European Commission is proposing to withdraw duty-free and quota-free market access for key exports of those ACP countries which have not signed EPAs. African countries have been strongest in resisting signing-up to EU’s EPA approach which they don’t believe works in the interest of their economic future. Hence, the ‘big-stick’ tactic by the European Commission. The Commission is clearly bargaining that those countries that have so far held out from signing the EPA will do so now simply to safeguard their traditional exports. The Commission has good reason for their thinking. Threats worked in the negotiations with the 15 Caribbean members of the ACP that signed a ‘full EPA’ in 2008. In the previous year, the Commission’s negotiators threatened that if Caribbean countries did not sign-up to the EPA, the EU would raise its import tariffs on certain key Caribbean exports making them uncompetitive in the EU market. This would have led to unemployment as well as revenue losses that Caribbean governments could not face. Even the most reluctant governments signed. However, Caribbean countries did not have to sign-up to a ‘full EPA’ which went beyond an agreement that would have been compatible with World Trade Organisation (WTO) rules. But, some governments accepted the promise that the ‘full EPA’ would open the European market to Caribbean services. Of course, five years later this has not happened in any meaningful way. Meanwhile, under the ‘full EPA’ Caribbean governments gave the EU commitments on services, competition, procurement and trade facilitationthat are still to be settled as global rules in the WTO, but which the EU wanted to establish not only for the Caribbean, but also as a precedent for negotiations with the more important and lucrative markets of Africa. As it has turned out no Caribbean country has derived any great advantages from the ‘full EPA’; they have continued to rely on the Cotonou Agreement that was signed in 2000 and expires in 2020. Indeed, the Caribbean experience of the EPA is that several governments have not implemented their commitments to remove tariffs on EU imports according to an agreed schedule and each of them is now at risk of being taken to arbitration by the European Commission. Realistically, governments continue to need the revenues from tariffs on European imports in the face of high debt, and budget and trade deficits. And, in the case of the governments that have implemented their commitments to remove tariffs on a number of EU goods making them cheaper, a number of local companies have found themselves unable to compete. The promised opening of the doors to the EU for Caribbean goods and services has also not materialised as much from a lack of informed effort by Caribbean companies as from blocks at the national level in many European countries. The proposal by the European Commission - to withdraw duty-free and quota-free market access for key exports of ACP countries that have not signed EPAs - has to go to the European Council for agreement before it can be implemented. This is why the protests in Brussels and the letter handed to the UK Business Minister, Vince Cable, by the 18 British NGO’s are so important. The letter urges Cable not to accept the proposal when it comes before the European Council and to ensure that the European Commission “respects on-going discussions about outstanding contentious issues and under no circumstances forces countries to ratify un-amended interim economic partnership agreements”. What is striking about these herculean efforts by leading European NGO’s to defend ACP states and their people, and to influence the decisions of their governments on the EPAs, is that there are no corresponding mass actions in ACP countries by NGO's and others to get the message of disappointment home to EU governments. In part, this is because ACP governments have not informed their civil society and – in some cases not even their parliaments – about the EPAs and the demands of the European Commission in these negotiations. All ACP governments should be standing-up for fair EPAs, and right now they should be standing shoulder to shoulder with Africa.